Has it already been 2 weeks since my last post? The days just seem to be flying by and we are already in July! We are finally enjoying some wonderful summer weather and there’s no better time to do some grilling. Grilling at my house is a year round affair but nothing beats grilling fruit in the summer. My favorite is grilled pineapple, the bbq bringing out even more sweetness. 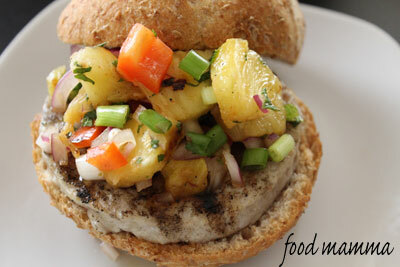 While preparing Mahi Mahi burgers for dinner, I figured the best topping would be a grilled pineapple salsa. The combination of sweet pineapple, smoky roasted red peppers with a spicy kick was fresh and delicious. 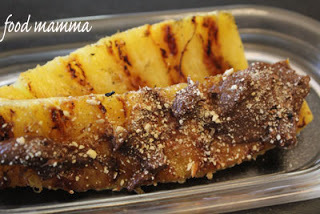 And hey, if you have some extra grilled pineapple, spread some Nutella and sprinkle some nuts and you have yourself dessert! Yay…summer’s here! Lets hope that sunshine is here to stay. Time for patios and barbecues and fresh summer flavours. We’ve been trying to eat more grains and veggies. Unlike hubby, I can’t eat a bag of celery and carrot sticks – its just too boring! This is the perfect salad that incorporates veggies and beans and with the addition of lemon zest, no one can call this boring. Ahh, Father’s Day. The one day a year that we get to honor the wonderful dads out there. I am lucky enough to have gotten the wonderful father that I did. He is a strong and amazing man. 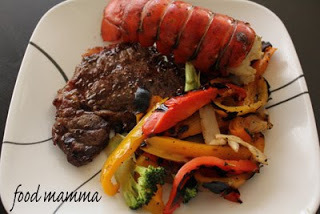 It was a lovely day – breakfast with my dad, made by my mom; fresh samosas with my father-in-law made by my mother-in-law; and a delicious dinner at home to celebrate hubby, with grilled steak and lobster. The perfect Sunday. To all the amazing fathers out there – Happy Father’s Day! pick up some nan khatai at the calgary food blogger bake sale! I’m so excited to be part of the Calgary Food Blogger Bake Sale taking place this weekend. Vincci, from “Ceci n’est pas un food blog” has rounded up local food bloggers to raise funds for Calgary Meals on Wheels. The bake sale is part of Market Collective’s 2nd Anniversary. Come down and meet Calgary’s own food bloggers and have a taste of their delicious offerings. Click here for more information and a list of the blogger participating. It was hard trying to decide what to make for the bake sale. I finally settled on Nan Khatai – Indian wheatlet cookies. These are cookies from my childhood and is a treat that my 19 month old son now enjoys. My dad makes these regularly and its the perfect offering for when friends drop in. These crispy, crumbly cookies can be made like below or you can add some cardamom. Delicious on their own, they are even better when dipped in warm milk or chai. Cream the margarine/butter and sugar. Once combined, add the eggs one at a time and then add the vanilla. Combine 3 cups of flour and baking powder. To the butter and sugar mix, gradually add in the flour and wheatlets, alternating between the two. Knead the dough and slowly add in the last cup of flour until the dough pulls away and is soft enough to roll into balls. Bake at 350 degrees for 30 minutes or until golden brown. 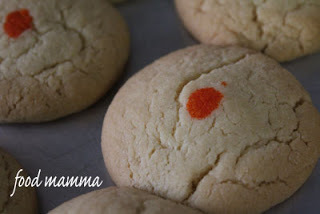 While still warm, place a drop of food coloring in the center of each cookie. I first came across this delicious square in high school chemistry. We were learning about measurements and, to teach us about how important accuracy in measuring was, we cooked! 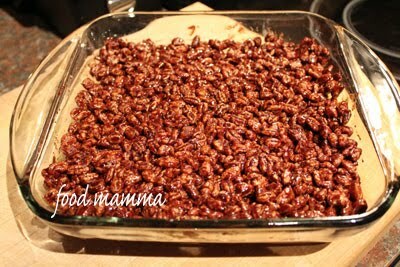 Each member of the team was asked to bring an ingredient and Mrs B. brough the puffed wheat. It was the best chemistry class that I can remember. Chocolately goodness in minutes, its the perfect lunch box snack. Over medium heat, melt the margarine. Add corn syrup, brown sugar and cocoa and let the mixture come to a boil. After 1 minute, take it off the heat and add the puffed wheat. Pour mixture into an 8″ x 8″ pan and cool before cutting it into squares. We’re less than a month away from our big office move. I know many of my co-workers will miss Cafe Mauro, which is located in the lobby of our building. Everyone raves about Sal’s sandwiches – the bocconcini sandwich served on top of focaccia or the chicken parmesan on toasted baguette. 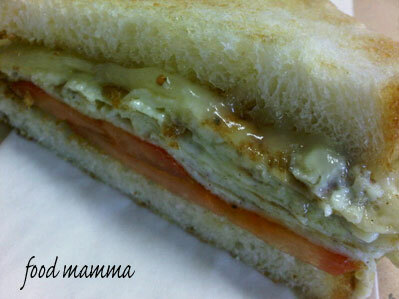 My favorite meal though at Cafe Mauro is breakfast; in particular the Fried Egg Sandwich. Nestled between two pieces of toasted and buttered sourdough bread are juicy tomatoes, the fried egg and provolone cheese. Its a simple sandwich but so delicious, and a great way to start the day. Its no secret that one of my favorite channels is the Food Network. 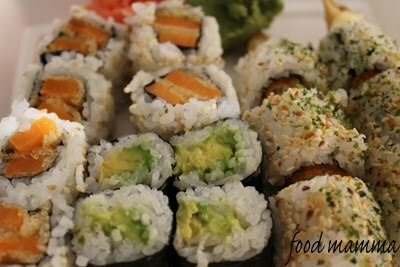 I can sit for hours watching chefs turn ordinary ingredients into mouth watering creations. One of my faves is Ina Garten, the Barefoot Contessa. I have recreated her recipes many times, and they are always a hit. Her recent episode “Outdoor Entertaining” featured Raisin Pecan Oatmeal Cookies and they looked so good, I had to try them for myself. 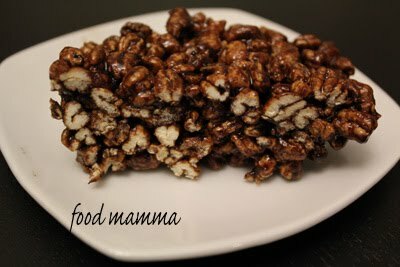 I substituted the raisins for chocolate chips (gotta have the chocolate!) and found that these were the most delicious oatmeal cookies ever. 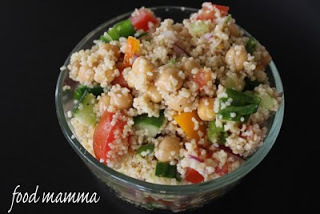 Another winning recipe from Ina! Sift the flour, baking powder, cinnamon, and salt together into a medium bowl. With the mixer on low, slowly add the dry ingredients to the butter mixture. 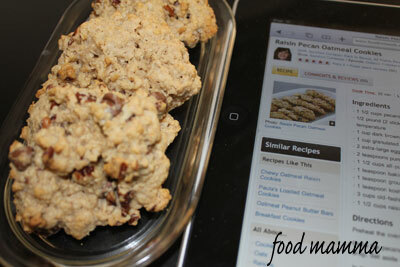 Add the oats, raisins, and nuts and mix just until combined. Using a small ice-cream scoop or a tablespoon, drop 2-inch mounds of dough onto sheet pans lined with parchment paper. Flatten slightly with a damp hand. Bake for 12 to 15 minutes, until lightly browned. Transfer the cookies to a baking rack and cool completely. Anyone who knows me knows how much I like Vietnamese food. At least once a week, I venture out to a great Vietnamese shop a couple of blocks from work. Sate beef with vermicelli and spring rolls makes for a very satisfying meal. 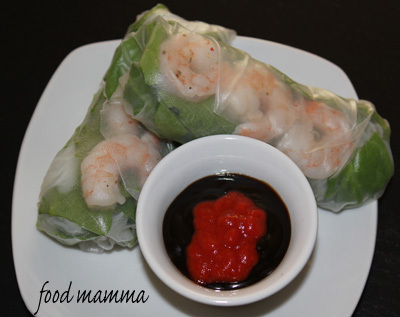 One of my favorite things to eat at home are the Shrimp Salad Rolls. It is the easiest thing to make and, you can have the perfect appetizer or snack in minutes. 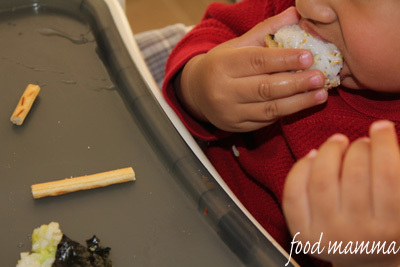 Place the rice wrapper in a bowl of warm water until soft and transparent. Line up 3 shrimp in the middle followed by a mint leaf, greens and vermicelli. Fold in the two ends and roll. 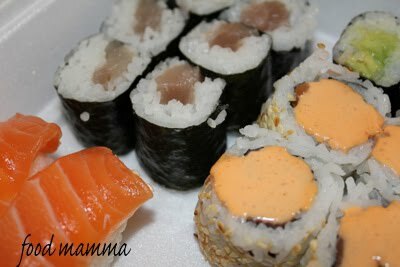 Serve with hoisin sauce and Sriracha chili sauce.